Federal Highway Administration University Course on Bicycle and Pedestrian Transportation: Student Workbook (Student Workbook) (FHWA-HRT-05-133)—Contains 24 lessons with technical summaries and background reading for students. Slideshow teaching aids (FHWA-HRT-05-134)—Twenty-four scripted slideshows (in Microsoft® PowerPoint® ) that correspond to the lessons in the Student Workbook. Overview lecture—A scripted one- or two-lecture overview slideshow (in Microsoft PowerPoint) that can be incorporated into existing undergraduate or graduate transportation courses. CD-ROM (FHWA-HRT-05-135)—Contains all of the course materials, including the Student Workbook and individual PowerPoint slideshows. The course is divided into five modules, which are sectioned into lessons. In the 24 lessons, the course covers a wide range of topics as described below. Lesson 1: The Need for Bicycle and Pedestrian Mobility—Explores the history of community design and its effect on bicycle and pedestrian travel. Lesson 2: Bicycling and Walking in the United States Today—Describes current levels of bicycle and pedestrian activity and examines reasons why bicycling and walking are not more widely used. Lesson 3: Pedestrian and Bicyclist Safety—Provides an overview of bicycle and pedestrian crash characteristics, crash analysis, and common crash countermeasures. Lesson 4: Bicycle and Pedestrian Planning—Provides an overview of bicycle and pedestrian planning issues and processes. Lesson 5: Land Use Regulations to Encourage Nonmotorized Travel—Provides examples of land use policies and provisions to encourage bicycle and pedestrian travel. Lesson 6: Traditional Neighborhood Design—Describes the concepts and principles of traditional neighborhood design, also known as new urbanism or neotraditional design. Lesson 7: Adapting Suburban Communities for Bicycle and Pedestrian Travel—Explores methods of redesigning or modifying existing communities to better accommodate bicycle and pedestrian travel. Lesson 8: Pedestrian Characteristics—Provides a summary of basic pedestrian characteristics used in pedestrian facility design. 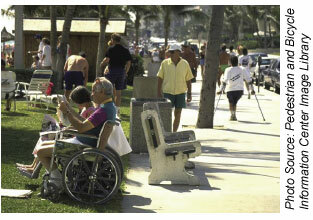 The guidance in this chapter will help create more accessible sidewalks, such as those shown in Figure 1. Lesson 9: Walkways, Sidewalks, and Public Spaces—Summarizes pedestrian facility design elements and provides examples of successful streetscapes. Lesson 10: Pedestrian Facility Signing and Pavement Markings—Provides an overview of signing and marking principles and practices for pedestrian facilities. Lesson 11: Pedestrian Design at Intersections—Summarizes intersection design features for pedestrians, including an overview of accessibility requirements. Lesson 12: Midblock Crossings—Summarizes design principles and features for pedestrian crossings at midblock locations. Lesson 13: Selecting Bicycle Facility Types and Evaluating Roadways—Describes several approaches to selecting bicycle facility types, and summarizes several methods to evaluate the bicycle compatibility of roadways. Lesson 14: Shared Roadways—Provides information on certain design elements of shared roadways for bicyclists. Lesson 15: Bicycle Lanes—Provides design guidelines for bicycle lanes, as well as innovative bike lane design concepts. Lesson 16: Bicycle Facility Maintenance—Describes maintenance programs and activities that are critical for successful bicycle facilities. Lesson 17: Bicycle Parking and Storage—Contains information on basic bicycle parking strategies, bicycle rack designs and specifications, and bicycle parking ordinances. Lesson 18: Bicycle and Pedestrian Connections to Transit—Provides an overview of effective practices in better integrating bicycle and pedestrian travel with the transit mode. Lesson 19: Greenways and Shared-Use Paths—Addresses basic planning and design issues for shared-use paths. Lesson 20: Traffic Calming—Explores the principles of traffic calming and provides numerous examples, design details, and photographs of traffic calming elements. 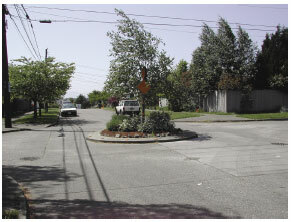 Figure 2 shows one type of traffic calming device, the traffic circle. Figure 2. Lesson 20 features a discussion of traffic calming devices, including traffic circles. Lesson 21: Bicycle and Pedestrian Accommodation in Work Zones—Describes typical work zone problems and solutions for bicycles and pedestrians. Lesson 22: Tort Liability and Risk Management—Provides a basic understanding of tort liability, risk management principles, and techniques for evaluating and monitoring existing facilities and programs. Lesson 23: International Approaches to Bicycle and Pedestrian Facility Design—Provides examples of bicycle and pedestrian facility design from Western Europe, Canada, and Australia. Lesson 24: A Comprehensive Approach: Engineering, Education, Encouragement, Enforcement, and Evaluation—Explores fundamental elements of these complementary programs and summarizes examples. The course material has several components that enable it to be taught as a full course at the graduate level or as one or two lectures in an undergraduate course. The lessons span a wide range of topics including an introduction to bicycling and walking issues; planning and designing bicycle and pedestrian facilities and their supporting elements and programs; and international approaches to bicycle and pedestrian transportation. The technical information in the Student Workbook is primarily intended to support classes offered in civil engineering and -urban and regional planning departments. The first edition of this course material (in whole or in part) also has been incorporated into classes in public health, public policy and administration, and environmental design. An overview lecture is available for instructors who would like a summary that can be incorporated into one or two lectures of an existing undergraduate or graduate course. How can I use these resources to develop a bicycle and pedestrian course? The Student Workbook and the corresponding slideshows can be adopted in their current form as the basis of an undergraduate or graduate transportation course. Similarly, the overview lecture easily can be incorporated as one or two lectures in existing undergraduate courses. Instructors are encouraged to adapt this material to form a curriculum that meets their needs. Most of the lessons are standalone, with lessons on similar topics grouped into modules. Most instructors using the first edition of these course materials personalized the lessons for their courses by removing some lessons, adding supplemental material, reorganizing the lessons, and adding exercises and local activities to encourage student participation. For these reasons, a detailed syllabus or course outline is not provided. What topics are included in the course material? The course is divided into five modules, and the modules are divided into lessons. In its 24 lessons, the university course covers a wide range of topics. The Overview Lecture summarizes many of these topics and can be used for one or two lectures in an existing undergraduate or graduate course. Where can I obtain the course material? Material for the Federal Highway Administration University Course on Bicycle and Pedestrian Transportation can be obtained on the Internet at www.tfhrc.gov. The CD-ROM containing the course material can be obtained by contacting Ann Do at ann.do@fhwa.dot.gov. FHWA published the second edition of the Federal Highway Administration University Course on Bicycle and Pedestrian Transportation: Student Workbook as Report No. HRT-05-133; the first edition is Report No. FHWA-RD-99-198. Researchers—This study was performed by the Texas Transportation Institute (College Station, TX) and the Toole Design Group (College Park, MD) in a contract through the University of Michigan Transportation Research Institute. Availability—The complete report will be available in early 2006 and may be obtained from the FHWA Product Distribution Center by e-mail to report.center@fhwa.dot.gov, by fax to 301-577-1421, or by phone to 301-577-0818. Key Words—Pedestrian, bicycle, educational material, university courses. Notice—This document is disseminated under the sponsorship of the U.S. Department of Transportation in the interest of information exchange. The U.S. Government assumes no liability for the use of the information contained	in this document. The U.S. Government does not endorse products or manufacturers. Trademarks or manufacturers' names appear in this report only because they are considered essential to the objective of the document.